A flognarde by any other name would taste as sweet: a kissing cousin to the better-known clafoutis (which is made with cherries), this custardy-pancake dessert lets seasonal fruit shine atop a bed of pillowy batter. Flognarde comes from the Occitan words fleunhe and flaunhard, which mean 'soft' and 'downy', respectively. 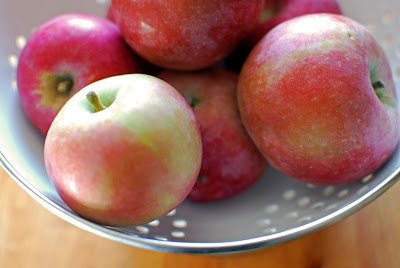 This apple flognarde certainly lives up to that sensual description: it has the body of a cake, the soft, inner creaminess of a custard or flan and a puffiness that holds the fruit of your choice like a sweet duvet. I chose to use apples for the fruit in this flognarde, who, nestled one atop the other, got downright delicious under the custardy covers. Unfortunately, this year's mild March seduced the local apple trees into flowering early, only to have the process halted with April's cruel frosts causing the orchards to lose 80% of their yield. I was discussing this issue with the mother of a student I work with, who was on the way to an apple farm with her daughter for some of these rare specimens. She listened patiently to my gushing about my love for freshly-picked apples. When I came to work the next weekend, there was a bag of orchard apples on the desk with my name on it! Truly touched by the gesture, I wanted to let the apples play the leading role in a dessert to honor the gift, especially given that they are currently worth their weight in culinary gold. 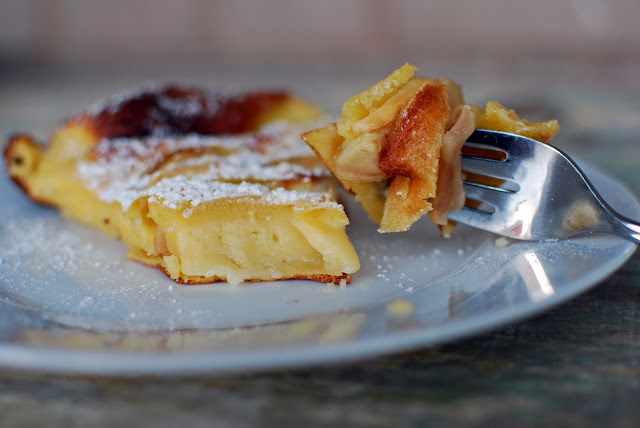 I decided on flognarde, a French pancake strewn with apples, whose odd name does not do its natural beauty and complex deliciousness much justice. 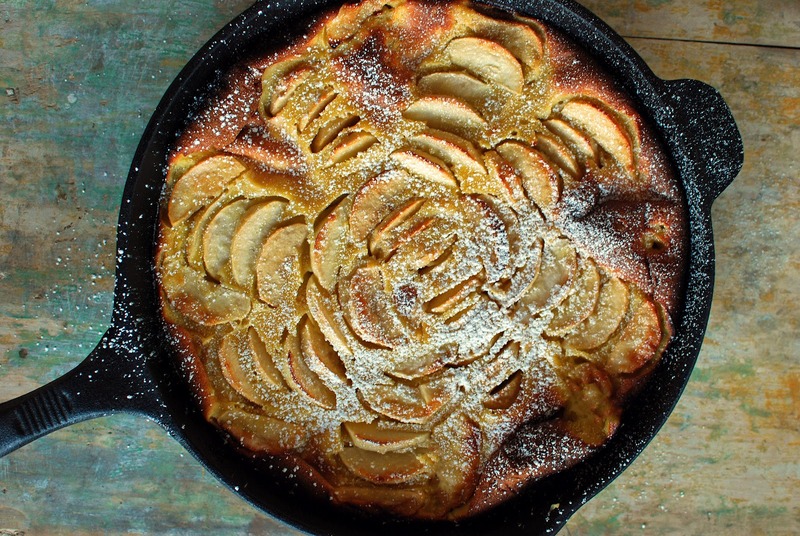 To make a flognarde, a simple batter of eggs, flour, sugar, salt, milk and vanilla is whisked until frothy, and poured to form a thin layer across the bottom of an oven-proof pan. The apples are sliced and arranged creatively across the set batter's smooth surface, sprinkled with additional sugar, and the remaining batter is then gently poured on top. 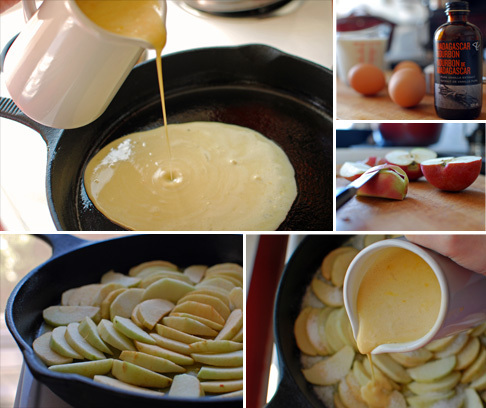 Once all the batter is poured, the pan is set in the oven and the batter miraculously puffs up in a golden embrace around the apple slices. It leads you to believe that 'what happens in the oven, stays in the oven' and what transpires therein is the salacious result of what a little heat can do when it meets eggs, flour, milk & sugar behind closed doors. My friends L. & S. were visiting from England and joined me on my back porch to enjoy this dessert with some unseasonably warm fall weather and a cold, caramel-y beer (which complemented the apples in the flognarde quite nicely). This dessert prompts the closing of eyes to enjoy the flavors and the collecting of every last crumb - to make room on the plate for the second (and third) slices, of course. The flognarde has a cake-y outside, a creamy, custard-y centre, and, like the best courtesans, needs only a sweep of powder to entrance. The combination of textures plays upon your tongue in such a way that you keep having to take more bites to figure out just exactly what this dessert is, or what it is that makes it so delicious. This experimentation easily takes you half a pan of flognarde to figure out before you give up and decide just to enjoy the rest in spite of, or because of, its mystery. Peel and slice apples into 1/4" thick slices. Set aside. In a blender or stand mixer, combine milk, eggs, 1/3 cup sugar, vanilla and salt until frothy. Generously butter a 9" cast iron pan or ceramic tart pan. Set on stove top on low heat and pour enough batter to form a 1/4" layer across the bottom of the pan and remove pan from heat when set. Arrange apple slices creatively on the surface of the smooth batter layer and sprinkle remaining 1/3 cup sugar evenly on top. Pour remaining batter carefully on top of apples and set in oven to bake until puffed and golden. The flognarde will deflate significantly when it cools. Sprinkle with confectioner's sugar and serve lukewarm or cold for a delicious snack or breakfast the next day. Enjoy! I agree - a combo of cakey and custardy is best. You and Calvados are welcome to visit my backyard garden any time! Very Yummy! Yes, custardy with cakey at the edges. I used nectarines and blackberries with this custard and it was delicious. 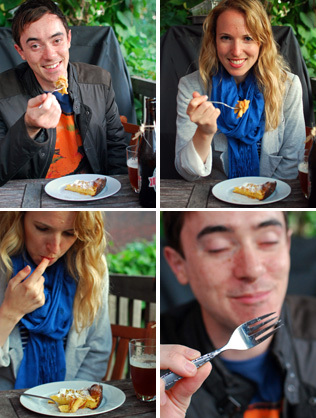 My husband, who is not a sweet lover, said "very good!" We will have it again! What temperature is the oven? I have made this many times and found that a balsamic & brown sugar reduction drizzled over the top with some powdered sugar pairs wonderfully with this - your recipe sounds delicious and I will use it over the holidays (or today "just because"). All writing/photography © Sonja Seiler 2012 unless indicated otherwise. All rights reserved. Simple theme. Powered by Blogger.